Posted on August 18, 2017 at 4:47 pm. 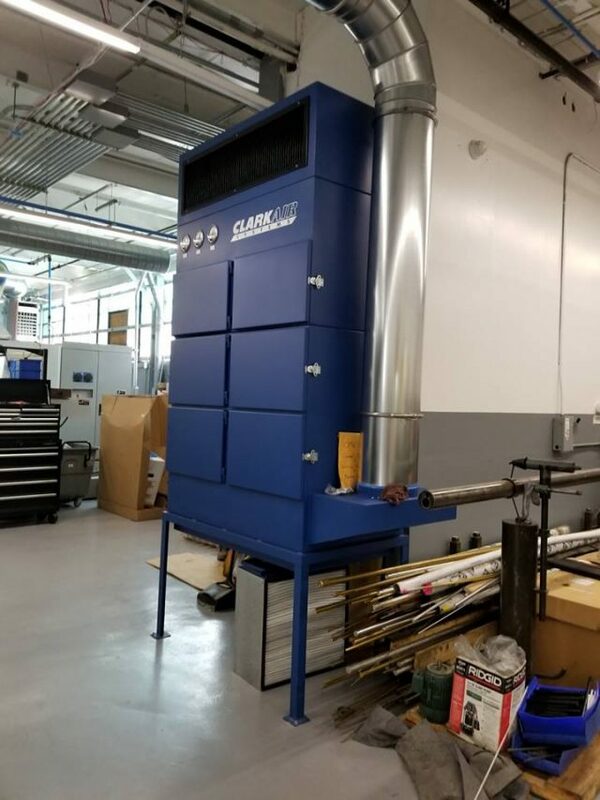 Clark Air Systems recommended and installed an OMW oil mist collector which took the place of four previous mist collectors and cut maintenance, improved continuous airflow, and greatly improved air quality on the manufacturing floor. Of all the industrial contaminants we’ve been asked to eliminate, Oil Smoke can be the most challenging. Like all smoke, oil smoke is made up of very small particles. Unlike most other smoke, its wet! It is often combined with lots of oil mists (larger particles) that complicate the filtering solution. Fiberglass filters have historically been used because of their wicking capacity. But the problem is fiberglass media tends to matt and open up and become less efficient in removing the mist and smoke over time. The filters in the OMW oil mist collector solve this problem by combining many different fiber types. Continuous high airflow – plugged filters that cause a dramatic loss of airflow is never an issue with a correctly-applied OMW Unit. Continuous high efficiency filtration – the outlet mist levels never exceeded 0.05 mg/m3 during the entire first year of operation. Low filter changes and less downtime – After suffering through weekly filter change-out requirements with the previous mist collectors, the OMW unit required no maintenance for over six months. Greatly improved indoor air quality — We’ve eliminated the stinking blue haze!